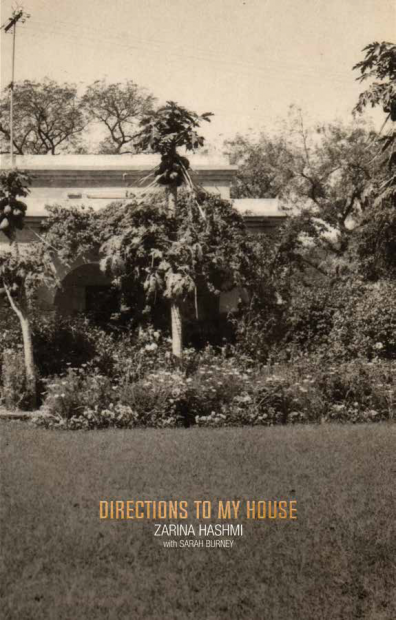 Directions to My House is a collection of essays, poems, artworks, and personal photographs by the artist Zarina Hashmi with Sarah Burney. “Memory is the only lasting possession we have,” begins Zarina, who was the A/P/A Institute at NYU 2017-18 Artist-in-Residence. In the pages that follow, she reflects on her life—her family’s experience during the 1947 Partition of India, her long career as an artist, and the many cities that she has called home. The book includes never-published material, and chronicles the artist’s travels and life around the world through multiple forms of expression. Zarina, who was born in Aligarh, India in 1937 and who has lived and worked in New York for more than four decades, adopts the recurring themes of home, displacement, borders, refugees, and memory.